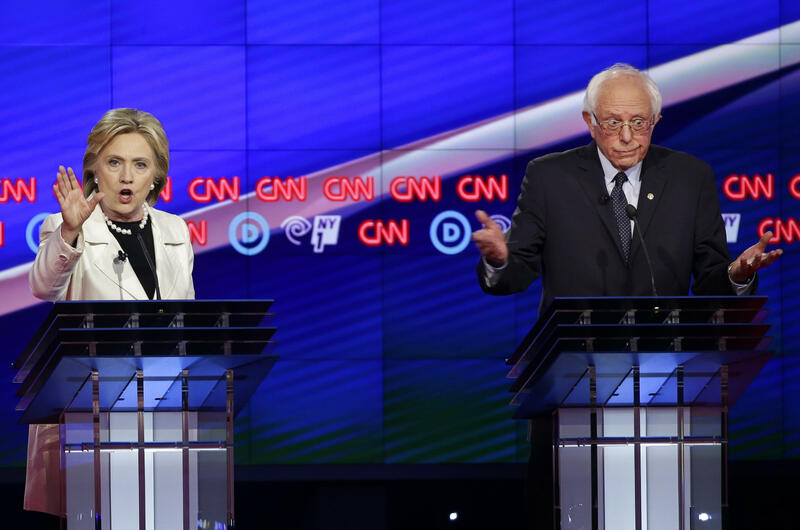 Democratic presidential candidates Sen. Bernie Sanders, I-V.t, right, and Hillary Clinton react as they speak during the CNN Democratic Presidential Primary Debate at the Brooklyn Navy Yard. During an exchange over how high to raise the minimum wage in Thursday night's Democratic debate, Hillary Clinton and Bernie Sanders began to shout over each other, hands raised, fingers pointed, both seeming to get a bit red in the face, while the audience cheered and booed in equal parts. It was quite a scene. As NPR's Ron Elving put it, "Both Sanders and Clinton showed flashes of animosity bordering on contempt." Moderator Wolf Blitzer of CNN tried several times to calm things down, saying, "Secretary, Senator, please," over and over. Finally, he exclaimed, almost shouting himself, "If you're both screaming at each other, the viewers won't be able to hear either of you. So please don't talk over each other." It was the latest example of something we've seen over and over during this presidential campaign: candidates yelling — at themselves, their competition, moderators and even the audience — with the message getting lost in the process. On Twitter, there were complaints about the noise. Some joked about the candidates' ages. And others seemed to touch on gender, and the way it might affect how different candidates are heard. For months, the Democratic side of the presidential debate had been considered to conduct quieter, more restrained presidential debates. But the tables seemed to have turned this week. Democrats were at their fieriest yet, and the Republican contenders are coming off a week of family filled town halls and a recent debate that seemed to focus a lot on policy instead of hand size and insulting nicknames. In the run-up to Tuesday's New York primary, Clinton and Sanders have been engaged in multiple battles — over who's more New York, who's more qualified, and who can make the most change. We may have to add another battle to this list — which of these two is the loudest.